WordPress is running on millions of websites all over the world. This powerful CMS enables website owners to manage their online web pages without any coding skills. Creating pages, comments, and almost all the required functions to have a normal website is available freely for everyone thanks to its open-source nature. To make best use of it, MouseStats provides value added services to it by empowering the WordPress-powered websites to enable analytics in their websites with a few clicks. 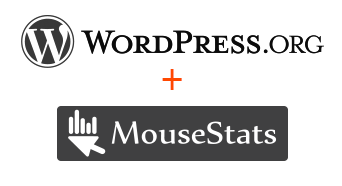 The MouseStats WordPress Plugin is available now to install MouseStats with the minimum required configurations, with just your MouseStats account ID. By enabling MouseStats in your WordPress Panel, you would be able to get a full suite of website heatmaps including mouse move heatmaps, click heatmaps, scroll heatmaps, attention heatmaps, and AreaStats. More features are also will be enabled. You are able to watch your visitors by using visitor playback services which is included in all MouseStats plans. Form Analytics will also help you to analyze your WordPress website forms. To directly get feedback from the website visitors, website surveys are also provided as a free service on all plans. You can generate your own custom survey and display its as a gadget in your website pages. It is fully customization, all colors, all steps and questions. Take a look to WordPress Integration documentation. You can enable MouseStats on your WordPress website in a few seconds by this ready-to-install MouseStats WordPress plugin. Bring Website Heatmaps, Visitor Playbacks, Form Analytics and User Surveys to your WordPress website. Starts from $0/m no credit card is required.